This was a very crafty day for Annette and Me! Check out this awesome beach book Carolyn created. This is made from pieces of a box!! That's right a box.. This book is even better looking in person! I finally updated the Gallery with updated layouts from the design team, layouts from the "About Me Class", awesome altered projects and mini albums! 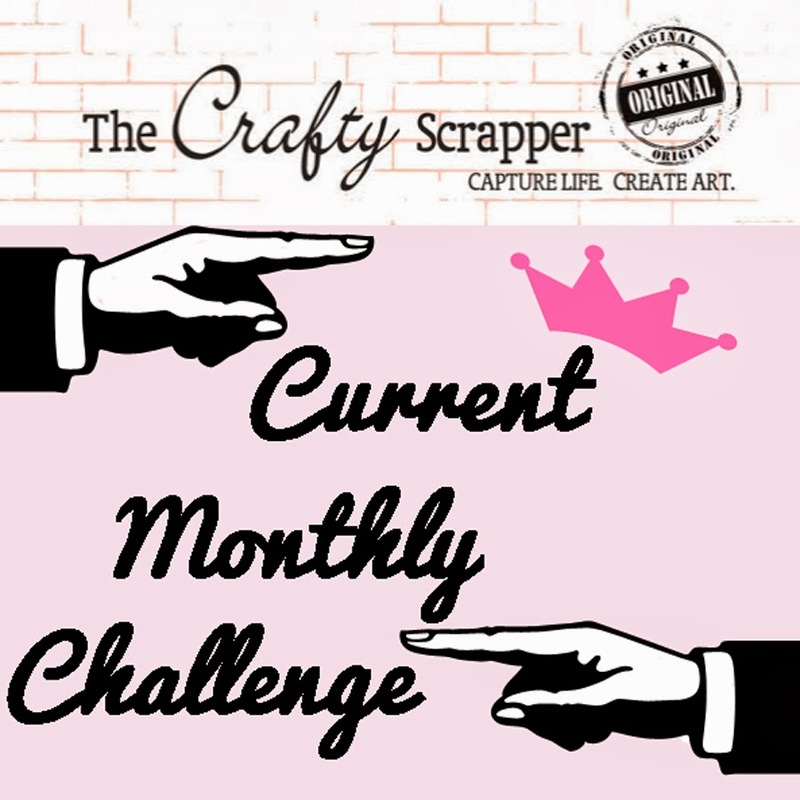 Logon to www.thecraftyscrapper.com and check them out! Sorry I couldn't give you a straight link, but my brain is fried and I can't remember how to do it! 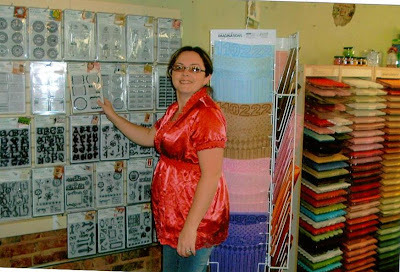 However click on the link to the right named "Our Online Store"
The Crafty Scrapper would like to announce our newest addition to the design team - Aimee Nichols aka CRAZY AIMEE!!! 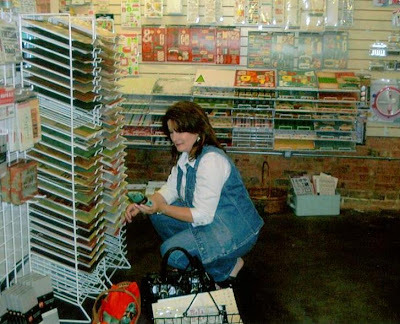 For those of you who don't know Aimee - she is our stamp - a - holic!! That is what happens when you become a permanent fixture at The Crafty Scrapper! We all know that Carolyn is so busy that she doesn't really have time to do alot of scrapbooking projects, but in those long nights of insomnia she thought of this awesome Recipe Book. This book is made from The Bo Bunny 9 X 9 album and with Bo Bunny tab inserts! This book was a HIT a GASC Arlington and we sold completely OUT! Don't be dishearted - Carolyn has placed an order and I will post on the blog when they are in!!! What a GREAT day for Annette! Us here at The Crafty Scrapper have always known how talented Annette is, now her talents have reached those in CANADA!!! 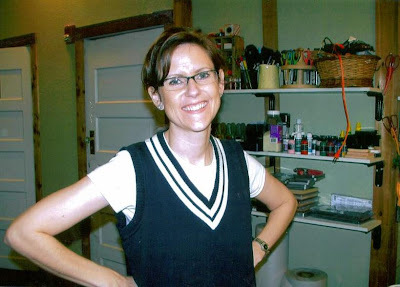 Annette has received an offer from a company (which we cannot expose right now) to become part of their design team!!! We are so proud of her and send all our best wishes to her! P.S. When the contract is signed and sealed - we will expose the company! For those of you who have become the little Crafty Scrapper family - Little Leta is back from living it up in California! Of course, one of her first stops after unpacking was The Crafty Scrapper! We love your smile Leta and you are very special to us! 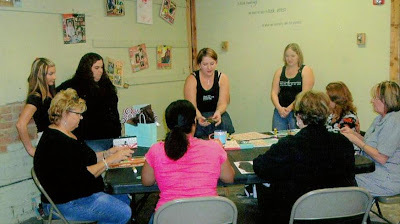 Okay, today I brought my camera and got a great picture of Annette's 4th of July Class. This is the cutest little book and of course it has just the right Annette touch! Call the shop and sign up ASAP because you know it will fill up fast! P.S. Check out EVENTS on the online store for other classes that will be offered shortly. I know that I said I would post Annette's newest creation for the 4th of July class today, HOWEVER, as always I forgot my camera...so tonight I will put it by my stuff so I won't forget it! On another hand, some of you may have seen this at the show - the new boy and girl KI collections...they are now in the store and online for your viewing (and buying) pleasures! While Carolyn and I were at the Convention a couple of customers stopped by and just had to take a picture with the "IT'S HOT" sign!!! She created this awesome layout and posted it on her blog which we have linked...CHECK IT OUT! Hope all is well with you! 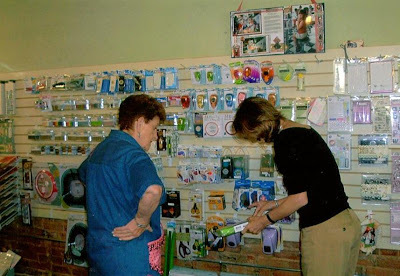 Well, we've got tons going on here at the store - mostly Carolyn at wits end putting back up merchandise! We've got the new Fontwerks stamps in the store and online. Come by or logon and check the out! Also, Annette has just told me that she has finished the example for the 4th of July class and I will picture it tommorrow and get it up ASAP here and on the online store! We're back from GASC and we are slowly recovering!! We had such a great time and enjoyed teaming up with one of our favorite companies - Luxe Designs!! We just wanted to let you know that the awesome Love Elsie lines - Toby, Roxie and Betty - are now on the online store..
Login and check them out! The Crafty Secrets booth was right across the aisle from us at the GASC. They were showing new items that had not even been previewed by retailers yet. 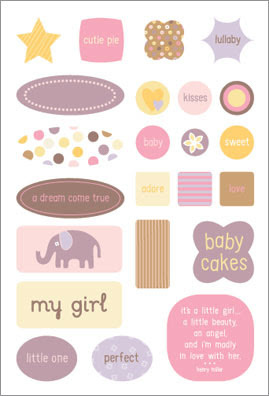 However, new in our store this week are the newest stamps from Crafty Secrets. We are excited to be able to bring these to you early. We have some of each stamp set. Also new are little things called "Sweet Chips" by Crafty Secrets. These include a boy outfit, a girl outfit and a little house made of chipboard, ready to be decorated. They are really cute too. The design team is already working on a couple of these and their examples should be coming Tuesday or so into the store. The new products are already in the store. 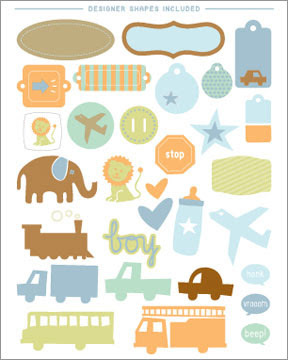 The new stamps from Crafty Secrets are not the only "New Thing" in the store, but first on the sneak peak list. Come in and see or stay tuned to the blog. Today was not as busy as the other days at the convention, but it was a great day. 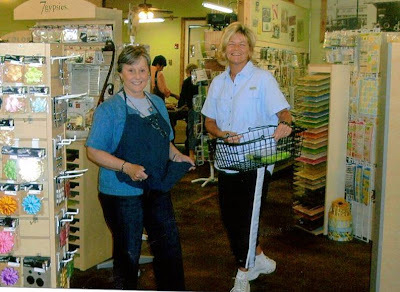 We had all items marked down 10% and then at the end of the day, Carolyn marked several things down 50%. The booth got pretty crowded then. Overall, it was a great Week-end. Several folks were taking pictures of our stuff & booth. We took pictures too, but have not had a chance to even get them out here for you. Lots to do this week, getting that done, and getting items back into the store (ordering, etc). It is empty compared to what it usually is, however, there are still some great items we didn't even take to the convention. Lots of news coming too on classes and new lines that will be coming to the store. Stay Tuned! Take Highway 360 south. It will change into frontage road on the south side of Arlington, but you are still on the right road. Highway 360 dead ends into Highway 287. The traffic on 287 does not stop, so be very careful at this intersection!! Highway 287 will wind a little bit and you will go under I-35E. Keep going. You will pass a lot of beautiful old houses. Keep going. At the stop light for Main Street & Hwy 77(also called Elm St), take a right. Take this west a couple blocks to the light (Madison St) and then turn left. Go two blocks after turning right, this will be College Street. Turn Left (one way street) and go about 1/2 way up the block and there we are on the left side of the street. Remember you can always call if you get stuck somewhere and we can direct you from that point. 972-923-3151. Thanks. We saw some more familiar faces today at the GASC, but know there are many more who haven't been out there. Today we picked up 13 boxes of Maya Roads Stuff, we had run out of so much of it Wednesday....sooo if you were one of those disappointed that we were out of a Maya Road product that you wanted, check back in with us Friday. Many have taken the LUXE classes and did some great layouts with their black & white paper. In the class they are giving out a coupon to use on their paper packs. We are the only ones carrying their line. Lots of positive reactions to the Queen & Co. and the Love Elsie Line--much different than what they had seen in the other booths, they said. Several like the look of the booth with the beach theme. It was really crowded today, and although we are hoping for a good day, we are not expecting it to be as crowded on friday, so if you were one of those who couldn't get into the booth or felt like the check out was too long...come on back. We saw a LOT of our friends out there at the all day crop. Was a busy day. We had shop set up in the crop room and also worked in the booth in the main hall. We are planning for a busy few days of sales and have tried to stock the booth as full as we could. As we said, we have the beach umbrella up and the beach theme going in the booth again this year. We are in spaces 506 and 508. When you come into the main convention area, you will notice that there are huge signs hanging above the aisles. We are on aisle 500. In fact we are sitting almost right under the sign that says "500". Hope to see you this week! What is GASC? Where are the Girls? Where should I go? What will be there? It is TIME. 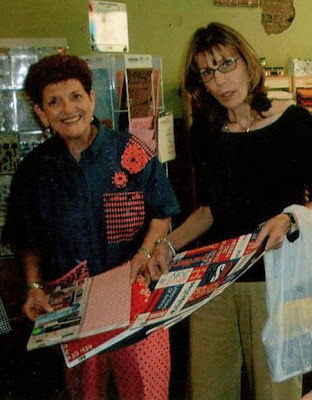 The Great American Scrapbook Convention also known as GASC is starting this week. Check out specifics for the Arlington show HERE . Even though On-line registration is closed, there are openings that can be filled that day in all the classes and in the crop. Remember that there are food vendors, but they were only taking cash last year, so plan for that! Wednesday: head to Arlington Convention Center EARLY so the booth in the crop room will be ready to go when the crop opens up at 10:00 AM. This booth closes at 5:00 PM that day. While some are in the crop room selling and showing, others will be in the bigger hall setting up the main booth. We are right next to the spot we were in last year, and we will have our beach umbrella --- so hopefully, we will be easy to find. We are right on the way to the "Make-N-Take" booth, so if you can get there, look for the umbrella and come see us! Thursday: open up at 9:00 AM for selling!! Come see us early for best selections. Last year a lot of the most popular items were gone by end of Thursday. Now, the main store will be open as usual back in Waxahachie, so if you don't feel like heading out to Arlington and parking and walking that much, just stop on by the store as usual. Now...what will be at the show in our booth??? 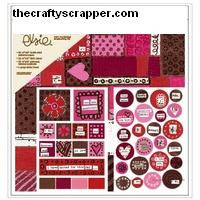 LUXE, Love Elsie, Daisy D, Moxie, Creative Imaginations, Queen & Co, Lots of Stamps and other pretties. Several ideas that haven't been out in the store yet and of course US! Come see! Hope to see you this week at one of the two spots! What a great time we all had Friday night at the store. 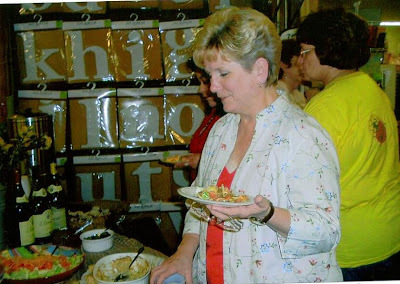 It was a celebration of the customers who have supported us and a time to show off the expanded space. I think the big chairs in the front will be a hit with the shoppers as well as those waiting for them. 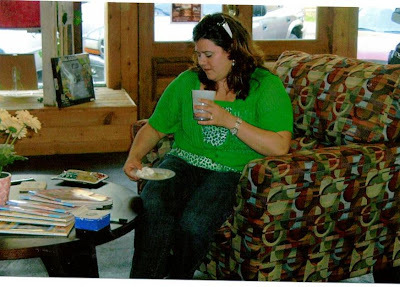 They are really comfortable and with the coffee bar, it is one of the only places to get a cup of coffee in the afternoons downtown.There were quite a few folks who came in for the first time Friday night and quite a few more who come in often. It was great to meet all the new folks and check up on those we don't see very often. 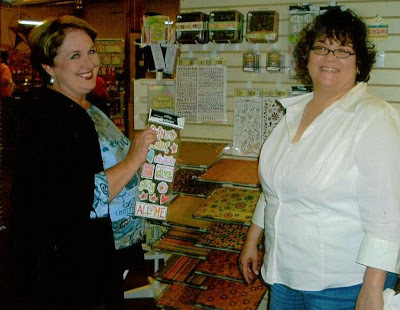 Julie, Jennifer and Tricia from Luxe Designs helped us celebrate the event by doing a make and take with some new papers in their line. We estimated that over 60 people did the little photo book/purse and each one was unique. As mentioned before, we are the only vendor carrying their line at the Great American Scrapbook Convention. If you missed seeing a preview Friday night, be sure to take a look at the Convention. Also on the Luxe subject, you have to try their rub-ons. They really are great. 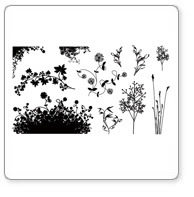 Not too sticky, rub off easily and some very neat designs. Pick some up when you visit our booth. More about the convention in tomorrow's post. For now, please enjoy the pictures of the festivities.